"Mian Mohsin Zia deserves a standing ovation. Consider your heart strings -- TUGGED! Great Book! Wow - this book will definitely tug at your heart strings! A great read all the way through and some insight and life lessons that everyone should take the time to think about. 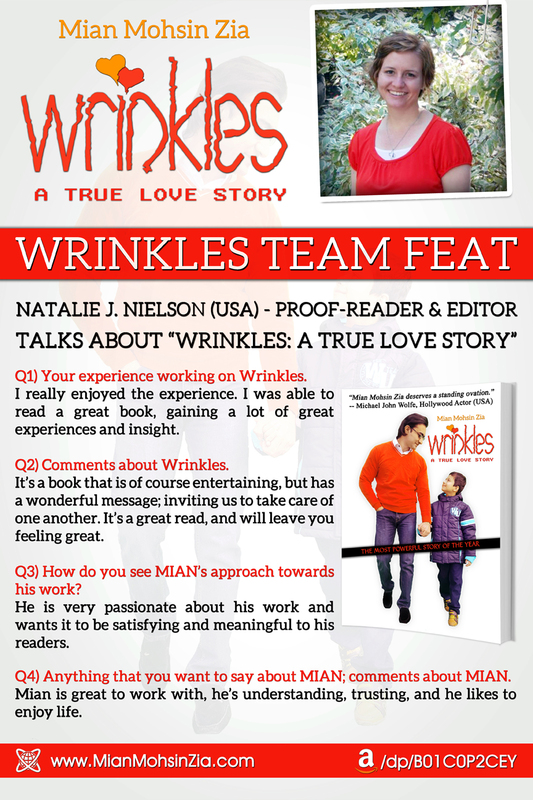 I highly recommend Wrinkles: A True Love Story, you will be glad you bought this book! Mian Mohsin Zia is an author on his way to the top - can't wait to read future work from him!" -- MICHAEL JOHN WOLFE, Hollywood Actor, USA. "Love Conquers All! I read the story in one sitting, front to back cover. It is an interesting story with twists and turns I did not always see coming. The story teaches us about love - between children and their parents, friends, different religions and different upbringings. If you take anything away from this moving story, I hope it is that love is unconditional and can be found in all kinds of places and people. 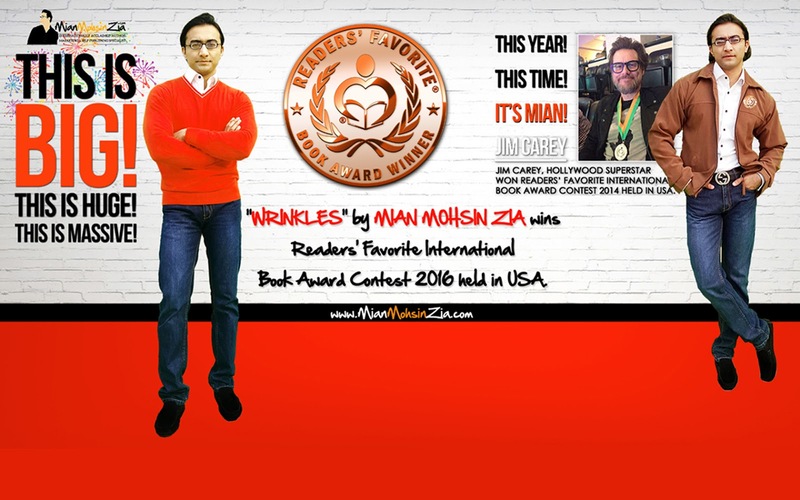 I thoroughly enjoyed the book." -- NICOLE HOLT, Hollywood Actress, USA. "A very touching story. It is a must read!" -- SAMANTHA HEER, Hollywood Actress, USA. "Great Story! I found the book very captivating. The flow of the story was great and I felt like I just couldn't stop reading until I finished it. The story is heart warming and touching. The characters were relatable and likable. I would recommend it to anyone looking for a enjoyable read about love." -- NICOLE FAHEL, Hollywood Actress and Producer, USA. 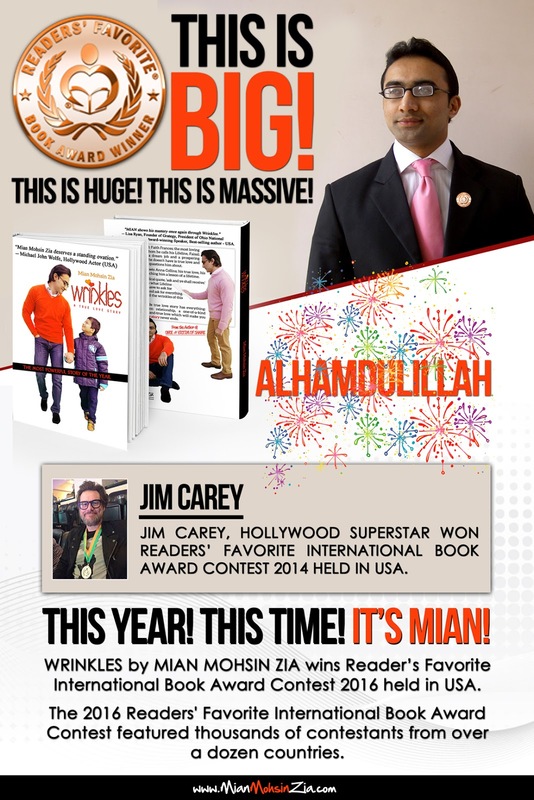 "It was an honor to read Award Winning Author, Mian Moshin Zia's, amazing and inspiring book, Wrinkles! I stay very busy but was able to read this book on my downtime. It was hard to put it down. Such a great story. The characters come to life, this story will touch your heart and soul and leave you wanting more. This is an absolute must read. One of the very best books I have ever read. I can't wait to see what this truly talented author writes next. Incredible!" -- KIMI ACOSTA, Hollywood Actress, USA. "A charming and heartfelt story showing the importance of family and friends. A compelling read." -- PHILIP HURD-WOOD, Actor and Writer, UK. 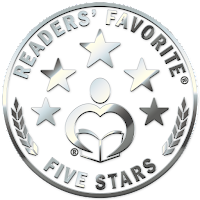 "It is a story I found hard to put down, even with a 3 year old around. It is a real heartwarming read. Wrinkles the title are the Wrinkles we bear deep in our souls from the past we have lead and there are many of those to be discovered in this story of friendship, kindness, determination and everlasting love. It is a must read and I will certainly look out for more of his work. Enjoy!" -- CAROLINE OAKES, British Film, TV, Theatre and Voiceover Actress, UK. "MIAN shows his mastery once again through Wrinkles." -- LISA RYAN, Founder of Grategy, President of Ohio National Speakers Association, Award-winning Speaker, Best-selling author, USA. "This story is thought provoking. The events will pull at your heartstrings, evoking emotions as you are turning pages to see how this story will unfold. 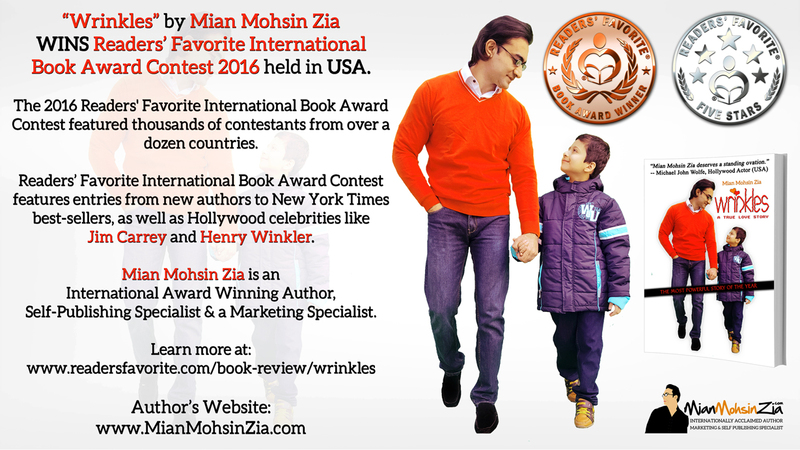 Wrinkles is a very powerful book that everyone should read." 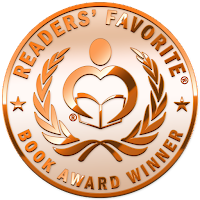 -- READERS' FAVORITE, USA. "I found 'Wrinkles' to be an endearing love story from beginning to end. Yes, I cried a few times. My favorite part is when questions arise. 'Why must he live a life of wrinkles? Why do people die?' These are the answers you must read for yourself as you delve into this precious book. MIAN visually represents the scene from the 1st chapter on the book cover where the protagonist wearing his orange sweater, leaves the home with his son. I strongly urge you to pick up a copy of this book today!" -- LORRAINE PRICE, Book Reviewer, USA. "WRINKLES -- Mian Mohsin Zia's new novel is perfect for anyone who loves 'love'. I have been following this author's career for some time, as I find his work fascinating. 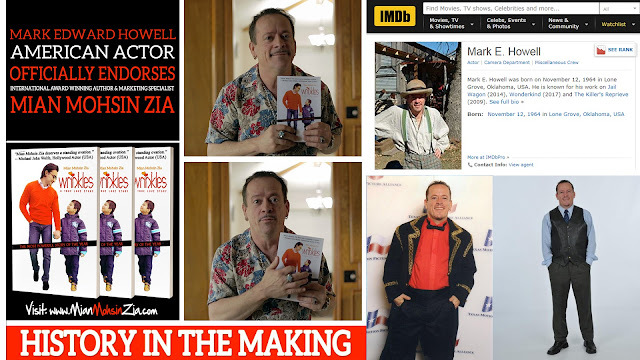 There is something remarkably compelling and intriguing about the subject matter he pursues, the intensity with which he approaches his topics, and the exceptional artistry and devotion he brings to each literary project. 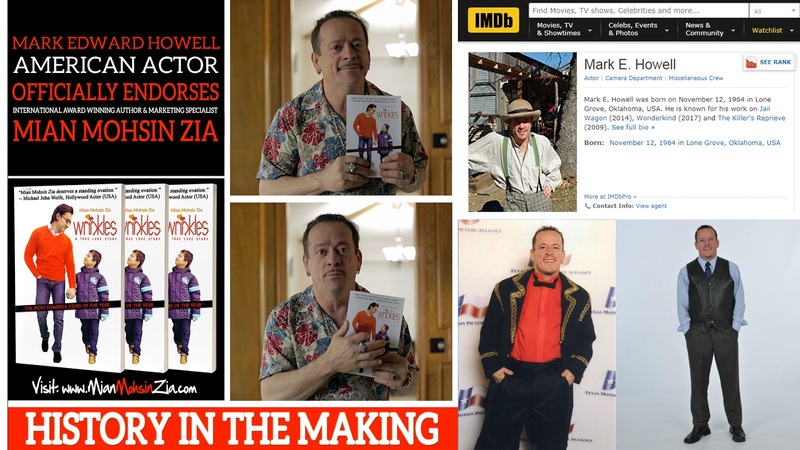 Each of his books is, as it should be, a universe unto itself, and all of his books are character driven, and all his characters are well developed. This is indeed a 'True Love Story' that engages, teases, and rewards." -- BURL BARER, Edgar Award Winner and New York Times Best-Selling Author, USA. 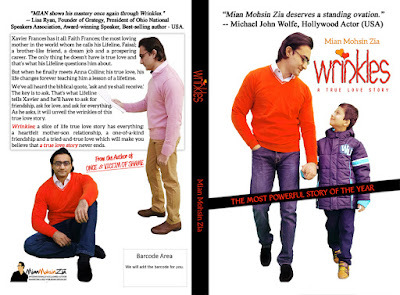 "What I love most about Wrinkles is the author's honesty and heartfelt boldness. We all need to address 'these' life questions because we need answers. Whether we believe in a higher power or we do not believe in a higher power, this book makes us think what is important in life. Personally, I am still thinking...Wrinkles addresses every possible type and definition of LOVE. In a world where many suffer and sacrifice for a moment of LOVE, it will give all readers hope. So, clearly this book will be popular with many readers. For me, I am telling my friends while holding back tears remembering the characters and characters' interactions." -- J. C. PAGE, Book Reviewer, Canada. "The title 'Wrinkles' itself is captivating. Mian's definition of wrinkles initiates the memory roll out of your individual wrinkles of life. True stories intrigue me and Mian's story is no different. This true story tells us how fulfilling our relationships can be and most of all, what goes around comes around. Be kind and selfless and good will come your way." -- FRANCISKA SORE, Professional Virtual Assistant, Croatia. 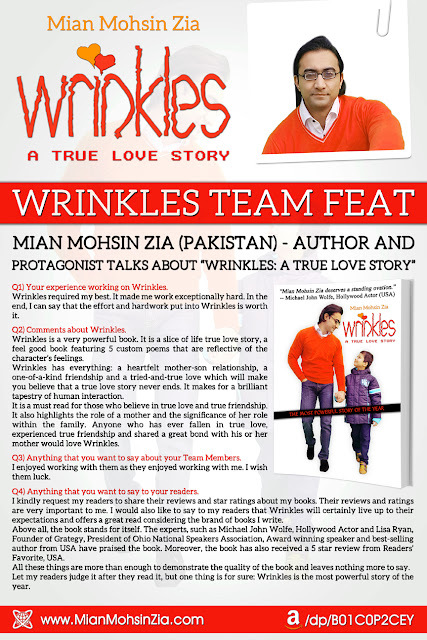 "I absolutely love the book 'Wrinkles' by Mian Mohsin Zia. This book took me to a place where I was wrapped in the arms of warmth and held in the glow of true love. It helped me to appreciate my mom and mother-in-law more. Parents are important! I laughed, I smiled, and I was brought to tears." -- HEATHER MILLWARD aka H. E. OLSEN, Author, USA. "What an out-standing book WRINKLES is! I enjoyed every second of it! It is a charming love story and though it is 'fiction', being so true to life, could be classified 'non-fiction'. Questions, questions, and more questions. A charming love story.....the love of ones Mother, Wife, & Child. The style of writing is heart warming. This book is a true picture of society. Every time I put it down, I couldn't wait to pick it up again and continue this classic read." -- JOHN STRANGI, Author, Actor SAG-AFTRA, USA. 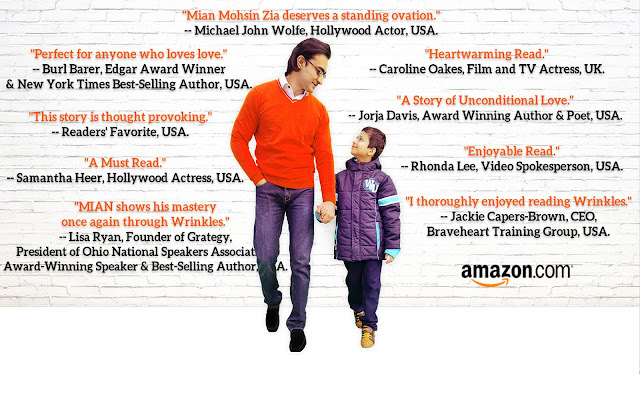 "A heart-warming story of love, family, and friendship." -- INDIA TAYLOR, Author, UK. 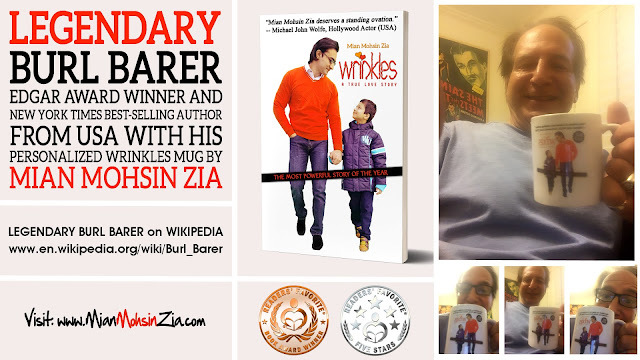 "I thoroughly enjoyed reading 'Wrinkles'. Although it is fiction, the life lessons shared in this book can be applied in our everyday lives. Your book, 'Wrinkles' is engaging, entertaining and empowering. I loved how the narrative paints pictures in the reader's mind as if we are present watching each scene unfold. I would recommend it for others to read. Great Job!" -- JACKIE CAPERS-BROWN, CEO, Braveheart Training Group, USA. 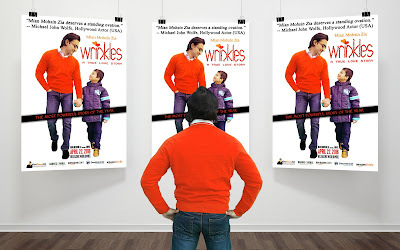 "I found 'Wrinkles' to be an endearing love story centered around family and the moving story of unbreakable connections between a child, a mother and a father. There's a strong message that no matter what happens in our lives, you can never runaway from the past and reconnecting with it can revitalize the present. 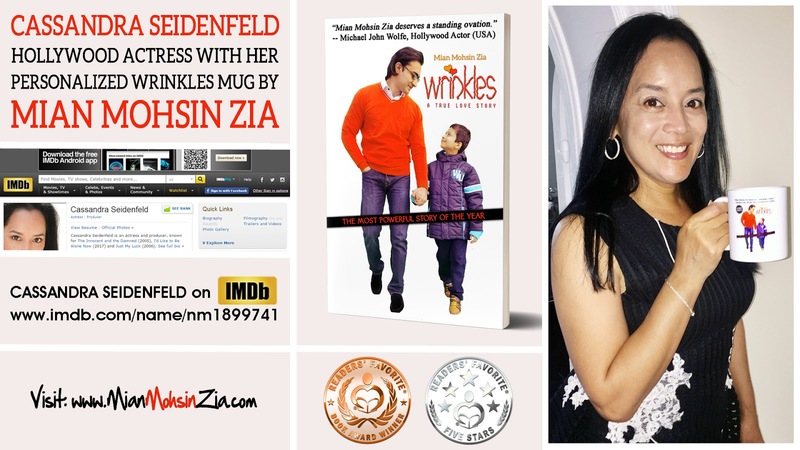 Anyone who's experienced love, and on any level, will find 'Wrinkles' a joy to read." -- KIM MICHELLE ROSS, Author, Australia. "Engaging story of life and love! Wrinkles has what I can only call a haunting tenderness about it. The story welcomes you into a family and friends that love each other across boundaries of color, faith, or ethnicity. It welcomes you into the world as the world should be. Xavier is a young man who falls for a beautiful woman who has a secret she dares not share. What happens throughout this heartwarming story of betrayal and love transcends the typical way we understand love. There are lessons to be learned from this tender story and the offering of a better way of life, one that does not pit faith against faith or color against color. The strength of love and commitment, the strong family bond, and the caring of each other that crosses all lines will enrich your heart and soul. I strongly recommend it." -- KATHLEEN CURRY, Teacher at Community Christian School, USA. 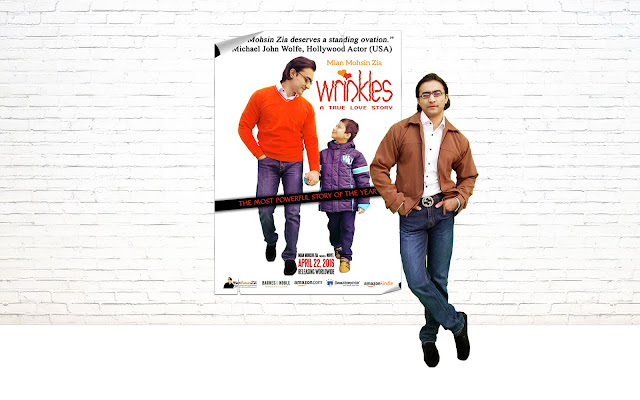 "Wrinkles is a tender story of unconditional love that crosses generations and genders, cultures and creeds and removes the wrinkles from souls. Well-developed characters that carry beyond the pages from Cape Town, South Africa into readers’ hearts and reveal the wrinkles resident there. Zia is a voice for tolerance and change one person, and perhaps one wrinkle at a time. Once again the author takes a slice of a life lived by a strong, complex central character in a circle of relationships that makes him everyman (and everywoman by extension). He asks the hard questions of life and leads readers to sometimes surprising answers that hold TRUTH that teach and transcend without a hint of didacticism. 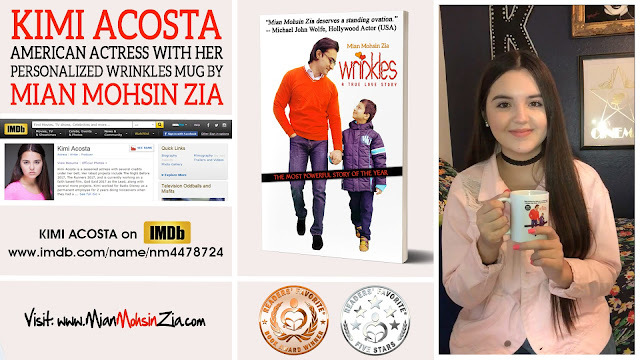 I have enjoyed watching Zia’s writing career unfold from book to book. He is a strong voice of not only literary Pakistan but the literary world without pretension, heavy-handedness or wordiness. His writing is honed and deep while telling a simple story in simple words that is not simplistic and lingers long after the final page is read." -- JORJA DAVIS, Award Winning Author and Poet, USA. "Beautifully Done! Mian has created a cast of beautifully painted characters of various religious and cultural backgrounds. In a world that seems adamant to divide us, Wrinkles’ beautiful themes can remind us that deep down we are all people created by GOD despite our various cultures and religions. The books protagonist, Xavier, is a beautiful example of humanity at its finest – his relationship with his mother, whom he lovingly calls Lifeline, his wife Anna, his friends, and his son are colorfully depicted, and each relationship is relatable in some way. Taking place in the beautiful city of Cape Town, this Christian man is confronted by culturally and religiously diverse people, and with each developing relationship readers can take a lesson from Xavier as well as from his wife Anna –whose motherly love is something to be envied. A story of love, parenthood, and religious tolerance that has greatly affected me in a positive way. I would certainly recommend this book to anyone wanting to expand their literary horizons." -- STEPHANIE LAUREN, Professional Proof-reader and Editor, USA. 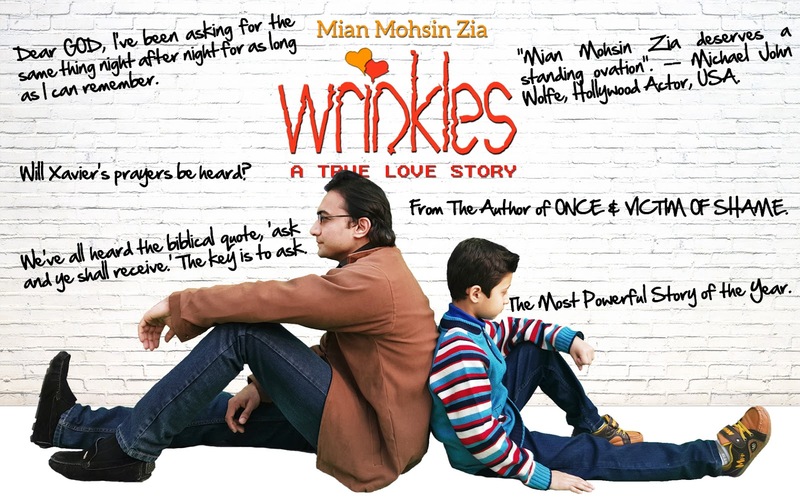 "'Wrinkles', by Mian Mohsin Zia, was an empowering and engaging read. 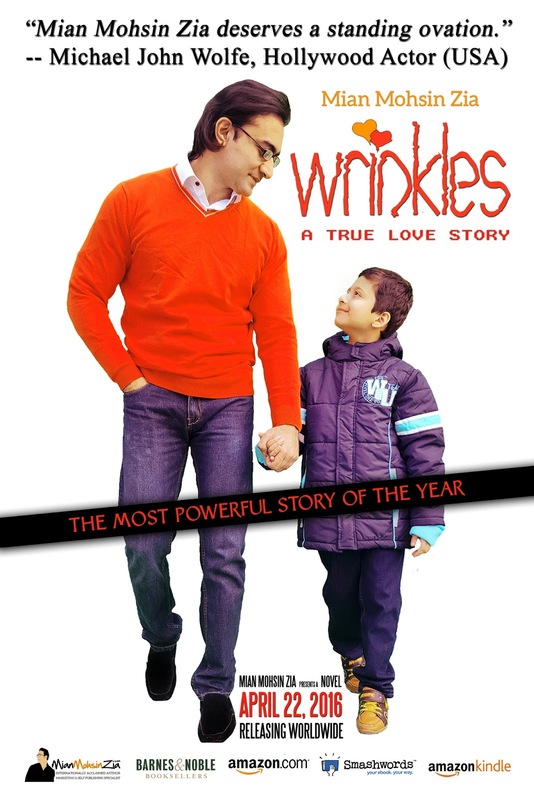 It is a heart warming story of friendship and love, that will stand the test of time. It shows us a love that crosses generations, genders and culture. I highly recommend 'Wrinkles' - I know that you will enjoy this heart felt story as much as I did." -- CAZZANDRA BELL, Serial Entrepreneur, Australia. "A superb manifestation of True Love! 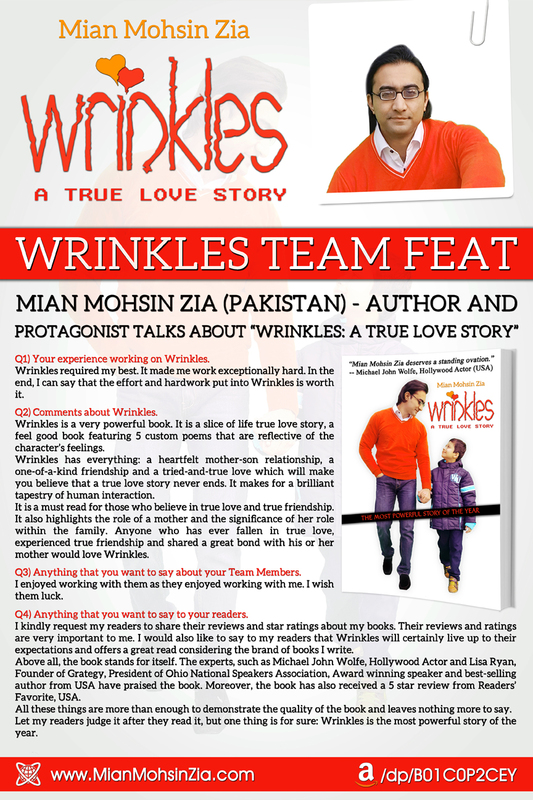 I had the pleasure of reading Mian’s book, Wrinkles, A True Love Story. Unlike most books, I read this in one sitting on a Sunday afternoon. Mian has the ability to paint a picture using words that help us to see every site, hear every sound, and feel every emotion. I am not sure what I was expecting when I started reading Wrinkles, but I was very pleasantly surprised by the wave of emotions I personally experienced while doing so. In today’s world of chaos, hatred, misunderstanding, and fear, it was a sigh of relief how Mian brought together cultures and religions in peace and harmony, with a sincere reverence for our differences and similarities. We all do bleed the same blood." -- LAURA M. PARKS, Author and Claims Support Specialist, USA. 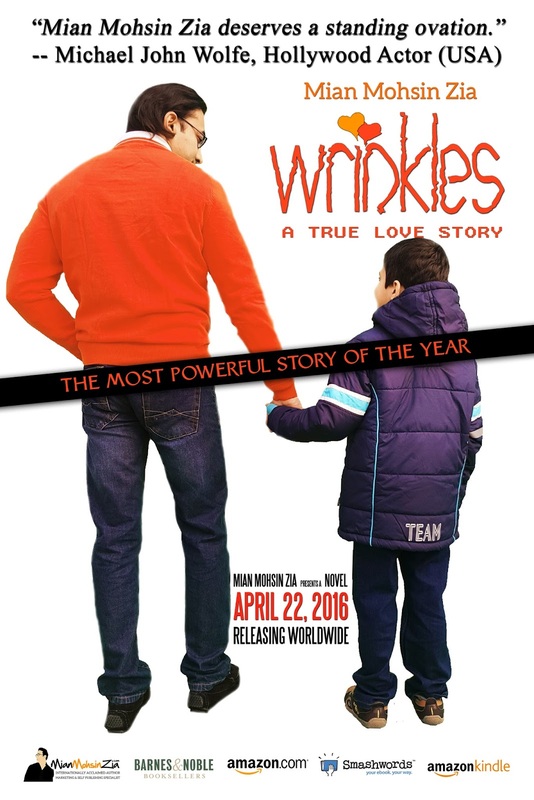 "Wrinkles - A Diverse Story of True Love, Friendship and Faith." -- KAYE LYNNE BOOTH, Writer and Editor, USA. "This book is brilliant! It disturbed me. I let it settle. I read it again. I loved it. 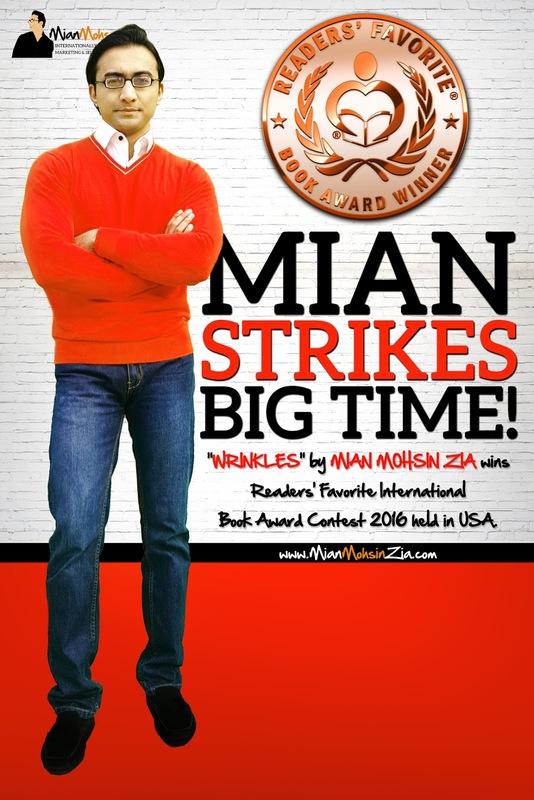 Mian does a wonderful job with his book. The characters are well-developed and multi-layered, the dialogues are believable and engaging and the descriptions are vivid and colorful. 'Wrinkles' might seem slow in pace in the beginning, but it keeps you captivated, because it is heartwarming and because you come to care for the characters and you wish that the book would have a happy ending. I loved that it wasn't a typical love story, I thoroughly enjoyed that it was entertaining, yet also gave a tons of food for thought which makes the book brilliant. It engages you and raises questions. I would also like to say,that the title of the book is extremely suitable for the story. Love, like life itself is filled with wrinkles, but the good thing about wrinkles is, that you can smooth them. Besides that, since the book deals with different types of love, it really is A True Love Story. To wrap it up, I'd use a quote in Latin. Dum spiro spero. Dum spero amo. Dum amo vivo. And this is what the book is about." -- INGA KUPP-SILBERG, Book Reviewer, Estonia. "Enjoyable Read! The overall theme of this book is Love. This is not just about love between a man and a woman but how love affects all the different relationships in our lives, how we show that love and how we respond to the love of others. This was a refreshing read and I would not hesitate to recommend it." -- RHONDA LEE, Professional Video Spokesperson, USA. "It is a very different read than I am used to. It came into to my life at a time when my life was much like the book. Thanks Mian for sharing this amazing love story." -- ANDREA RENEE SMITH, Author, USA. "Mian artfully crafted a story where the characters and their interaction with one another help the reader discover that despite wrinkles on our souls caused by trials, heartache and tragedy, true love can be found." -- SHAREE WANNER, Book Reviewer, USA. "Told from the Heart! I found myself drawn into the story of Xavier, his friends and family and of course, his love interest, Anna. There is a sweetness in his connections with those important to him, in particular, the love and closeness he has with his mother, whom he affectionately nicknames, 'Lifeline'. 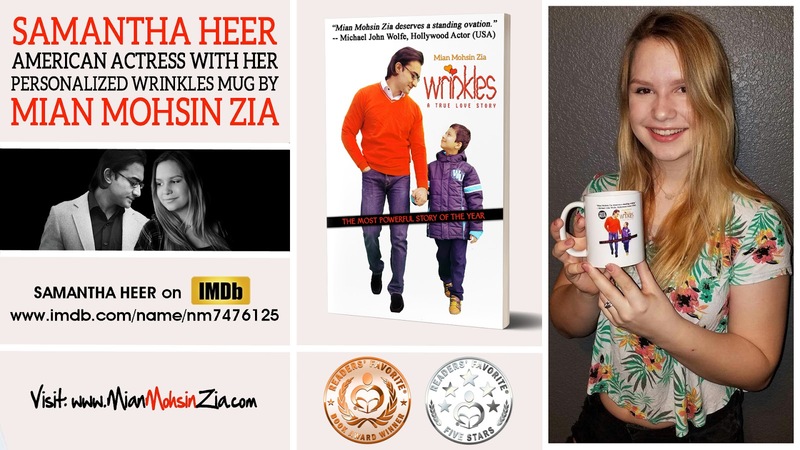 You will enjoy this heartwarming story." -- FRANCESCA ROMERO, Founder / Owner at True Word Literary Management, USA. "Thought Provoking! 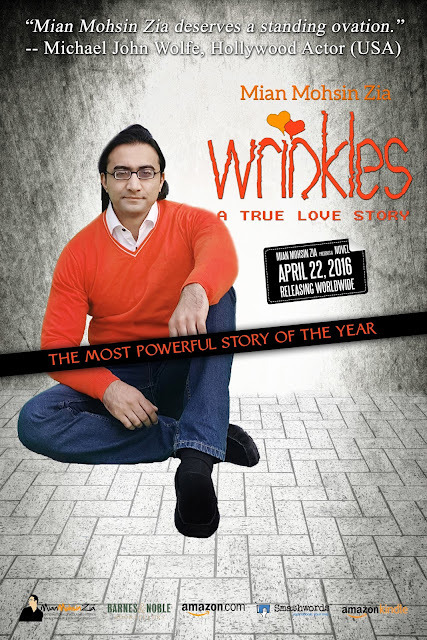 Intrigued by the storyline of family, love and dedication I looked forward to reading Wrinkles: A True Love Story, and I was not disappointed. The characters are well written and the plotline easy to follow. This is not the typical book that I would read as it contains many references to religion, but I did find the story thought provoking, sincere and very touching." -- SIV MARIA OTTEM, Author, Norway. "I feel so blessed to have been able to receive a review copy of this book straight from the author, and I am doubly glad to have read the book. Superbly written and with such imagery that I am taken back and forth from present to past in a matter of chapters and paragraphs. The story of love's expression and the journey to and through that love. 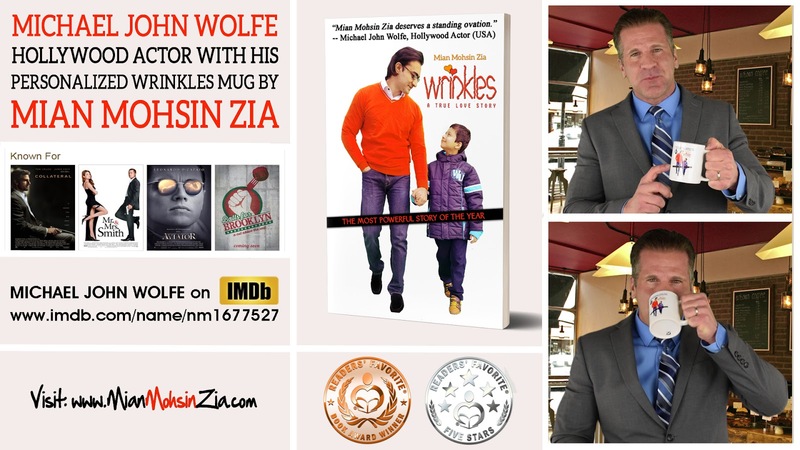 I applaud Mian Mohsin Zia for the way the book is written and the story told. 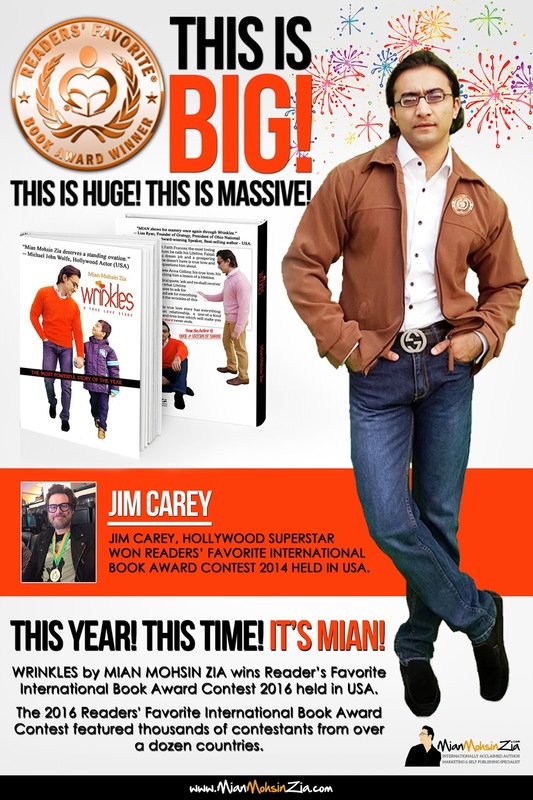 I'm looking forward to future books by this author and re-reading this book as well." -- CLAIRE GAGER, Author, USA. "A heart warming story about family, friendships and love. Engaging from the beginning to the very last page. Life lessons learned throughout the book. At times you feel your heartstrings pulled. The book reminds us that unconditionally, love is the most powerful force in the universe. The book is well written and you find yourself watching each chapter unfold. Well done!" -- TONI EZZELL aka VICTORIA HARTLAND, Author, USA. Excerpt from "Wrinkles: A True Love Story"
A crease on the skin is referred to as a wrinkle, as well as a crease on clothes or fabric. Either on skin, clothes, or bed sheets; wrinkles are never appreciated, and the goal is to remove them. But what about wrinkles on the soul? Our sins and mishaps in life create wrinkles, but these wrinkles can’t be seen, only felt. They keep our souls from being as free and pure as before. We feel these wrinkles on our soul by listening to our inner voice, by feeling our ill-doings and by realizing our mistakes. Those who are lucky enough get the chance to iron out their wrinkles, but some have to wait for years, or even for a lifetime to get them fixed. This story is about creases on the soul that need to be fixed, and it may take years, or maybe a lifetime. Who knows? Only time will tell. These creases on the soul are the wrinkles. Xavier Frances moved silently toward his son’s bedroom door. This is the day, he thought, as he pushed down the nervous anxiety surging through his body. “If you say a birthday wish out loud, it won’t come true, kiddo. You know that,” Xavier chastised kindly, with a smile crinkling his face. “Though I think I know what you wished for. You wished to meet your mother, didn’t you?” Xavier said soberly, trying to mask the uneasiness he felt whenever he mentioned her. Xavier could see the boy’s excitement build as the child took a deep breath to calm himself. 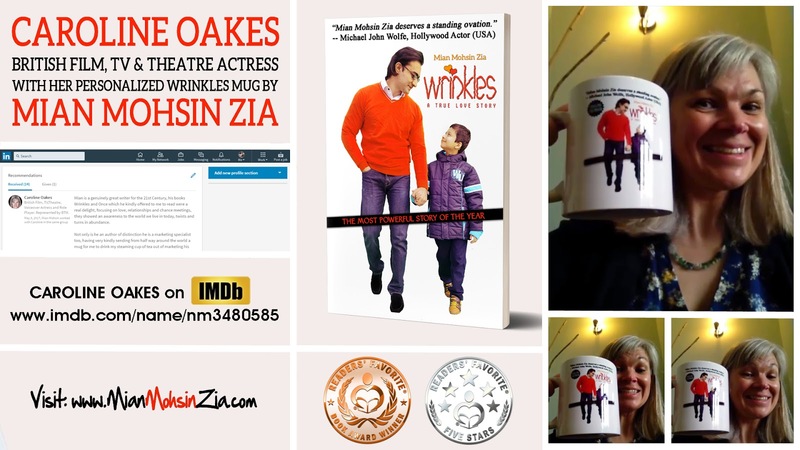 Xavier Frances has it all: Faith Frances; the most loving mother in the world whom he calls his Lifeline, Faisal; a brother-like friend, a dream job and a prospering career. The only thing he doesn’t have is true love and that’s what his Lifeline questions him about. “Amen,” Faith said as a whispered echo. “I’m so proud that the bank chose you to represent them at the expo this week.” Faith said, setting a plate of French toast at the head of the table in front of where Xavier sat. “You know what would really move my heart, my son?” Faith questioned. “What would move your heart, Lifeline?” Xavier cut a corner off his French toast and ate it, chewing slowly so as not to spill any crumbs on his clean business suit. But when he finally meets Anna Collins; his true love, his life changes forever teaching him a lesson of a lifetime. Xavier walked the few feet to the booth next to his and cleared his throat. The woman ignored him, bending over her table while she shuffled papers from one place to the next. Xavier coughed again, louder this time, and the woman looked up. “Oh, hello. I didn’t see you.” She didn’t extend her hand in greeting. “Good day. I’m Xavier Frances from African Pride Bank. You’ve already met my colleague, Ralph Mann.” He politely extended his right hand toward her and she reluctantly took it in a limp handshake. “Yes, I met him,” she said with an unimpressed tone. She picked up her coffee and took a sip. Xavier tried not to notice her pretty arm as her loose three-quarter sleeve fell back to her elbow. “I’m Anna Collins, lecturer at University of African Scholars,” she added as an afterthought. “Nice to meet you, Anna,” he said as he shoved his hands into his pockets. “Oh, right, yes. Why do you call her that anyway?” Anna asked. “I don’t really know what to say. I don’t do this often.” Anna looked a little shy. “What, eat?” Xavier asked with a laugh. “No, I mean eating with a stranger,” Anna said. “I’m not a stranger. You know me from the expo. We’ve shared the last six days with each other.” He noticed she smelled particularly nice, like apples. Maybe it was her perfume, or her shampoo. “Lifeline?” The word was a croaky whisper from Xavier’s throat. He coughed quietly. Xavier parted the hospital curtains and stepped through. Lifeline was lying on a neatly made metal bed, a drip attached to her left arm. She had a small bruise on her head, above her right eye. “Your head! You’re injured! Nobody told me you were injured!” Xavier exclaimed. “I need you, Lifeline.” Xavier felt tears behind his eyes. “No, you don’t need me,” Faith said honestly. “Lifeline, I do. . .” Xavier started before Faith interrupted him. “Please, Xavier, just listen,” Faith said. I know no other deed that could comfort me in this lonely world more than to take care of you. Your smile, your voice, your shelter is what I always need. Your affection and care made me a tree from an ordinary seed. I know no other deed that fills me with more pride than to hug you tight. You taught me the lesson of a lifetime by holding me when I had no one around. I don’t know any other deed that is as substantial to any creed than to find heaven under a mother’s feet. You always inquire to ensure whether I am fine. That’s why I call you ‘my Lifeline’. I don’t know any other deed that could express my emotions than to say to you: Lifeline, I love you. A man, whose name badge read ‘Faisal Israr,’ approached Xavier. “Are you from around here?” he questioned Faisal as he checked out the form. “I’m originally from Pakistan,” Faisal said as he signed the form. “It’s nice to see a young guy like you donating.” Faisal said as he labeled the bag with the start and end times of the blood sample. “You wouldn’t understand, Faisal,” Xavier said as he placed his hand on Faisal’s shoulder. “Well, then, I wish you luck.” Faisal held out his hand for Xavier to shake and smiled before turning to the next donor already waiting in the chair. Xavier took his phone from his pocket and opened his gallery. He scrolled to the picture and then handed the phone to Faith. “Thank you for falling in love, Dear,” Faith smiled knowingly at her son. We’ve all heard the biblical quote, ‘ask and ye shall receive.’ The key is to ask. That’s what Lifeline tells Xavier and he’ll have to ask for friendship, ask for love, and ask for everything. 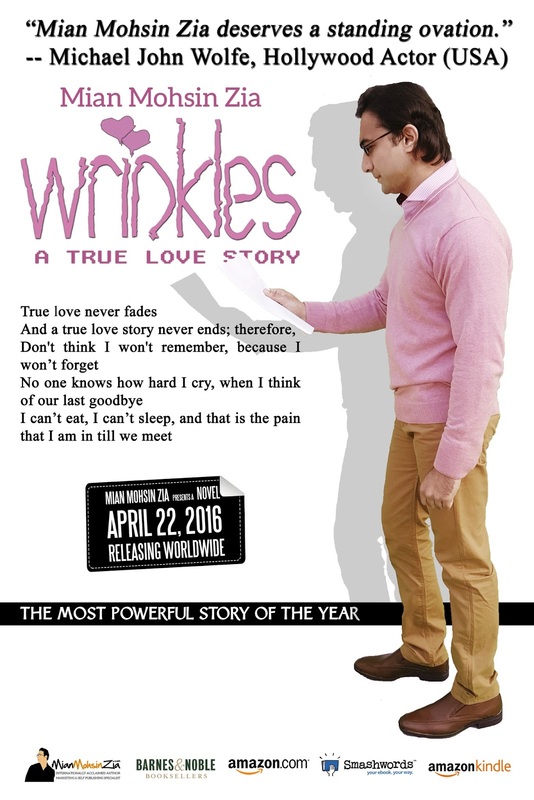 As he asks, it will unveil the wrinkles of this true love story. “What do you know about me?” Anna hissed. “You’re wasting your time,” she said as she dismissed him. “It won’t work!” Anna said. “I will make it work!” Xavier responded. “Why don’t you listen?” She slapped her hand down flat on the table, almost knocking over her water glass and raced from the restaurant. “I don’t see a reason why she wouldn’t.” Faisal snuck a look at Xavier, walking on his right hand side. “That doesn’t answer my question.” Xavier rubbed his face with his hand as he walked, as if brushing off something. “All I can say is that true love never fears.” Faisal placed a hand on Xavier’s tensed shoulder. This is how I am and I will be till we meet. Dear GOD, I’ve been asking for the same thing night after night for as long as I can remember. Will Xavier's prayers be heard? Wrinkles; a slice of life true love story has everything: a heartfelt mother-son relationship, a one-of-a-kind friendship and a tried-and-true love which will make you believe that a true love story never ends.